There are some infrastructural requirements and systems that are important in an educational institution for the growth of faculty. Library management is one of the most important of them. It has a direct bearing on the quality of research and teaching. 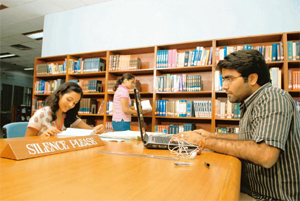 Most of our top B-schools are stacked with an impressive number of books, journals and electronic databases (see table). The numbers, no doubt, are very important; many of our lower-rung B-schools don’t have even 5,000 books in the library and few subscribe to any reputed international journal. But more than the numbers, it’s the competence and attitude of the librarian that are important. A librarian can play a proactive role and transform a library from being just a storehouse of books and journals into a dynamic information centre that facilitates the building of intellectual capital of the institute. It’s the quality of the librarian’s responsiveness to the needs of faculty that makes all the difference. For this she has to be well-qualified to understand the needs of researchers. She should also be well-trained in classifying and arranging information, so the required information can be made available at short notice from faculty members or research scholars. The search process should be made easy. The librarian should also be networked with booksellers and other libraries, so that the library is always updated with relevant reading material. There should also be a constant information flow between her and the faculty members so that the latter are updated on new arrivals and vice versa. Faculty should have access to all reputed national and international publications in their domain. In the past few years, the electronic component of the library has also been expanding. At the Indian School of Business (ISB) in Hyderabad, for example, a majority of the reading material is in the electronic format. This makes it imperative for a librarian to be skilled in handling technology-enabled resources. Electronic databases also help generate information related to the reading pattern of the faculty, which can be used by the librarian for subscribing to various e-journals. I spoke to Goyal, who works at a lower-rung B-school in Gurgaon after his retirement from MDI. “It is very important for the librarian to understand and serve with speed the research needs of the faculty who are the clients of the librarian, and it greatly helps if the management is supportive, says Goyal. He had the generous support of MDI’s management in expanding library resources. He was also elevated to the status of a professor. “Only about 15 B-schools in the country have librarians as professors,” says Goyal. Only about 15 B-schools in our country could also be termed efficient. Premchand Palety is director of Centre for Forecasting & Research (C-fore) in New Delhi, from where he keeps a close eye on India’s business schools.